A few years ago Bill Lanouette brought out a new, revised edition of his authoritative, sensitive and outstanding biography of Szilard. It is essential reading for those who want to understand the nature of science, both as an abstract flight into the deep secrets of nature and a practical tool that can be wielded for humanity's salvation and destruction. As I read the book and pondered Szilard's life I realized that the twentieth century Hungarian would have been right at home in the twenty-first. More than anything else, what makes Szilard remarkable is how prophetically his visions have played out since his death in 1962, all the way to the year 2014. But Szilard was also the quintessential example of a multifaceted individual. If you look at the essential events of the man's life you can see several Szilards, each of whom holds great relevance for the modern world. There's of course Leo Szilard the brilliant physicist. Where he came from precocious ability was commonplace. Szilard belonged to the crop of men known as the "Martians" - scientists whose intellectual powers were off scale - who played key roles in European and American science during the mid-twentieth century. On a strict scientific basis Szilard was not as accomplished as his fellow Martians John von Neumann and Eugene Wigner but that is probably because he found a higher calling in his life. However he certainly did not lack originality. As a graduate student in Berlin - where he hobnobbed with the likes of Einstein and von Laue - Szilard came up with a novel way to consolidate the two microscopic and macroscopic aspects of the science of heat, now called statistical mechanics and thermodynamics. He also wrote a paper connecting entropy and energy to information, predating Claude Shannon's seminal creation of information theory by three decades. In another prescient paper he set forth the principle of the cyclotron, a device which was to secure a Nobel Prize for its recognized inventor - physicist Ernest Lawrence - more than a decade later. Later during the 1930s, after he was done campaigning on behalf of expelled Jewish scientists and saw visions of neutrons branching out and releasing prodigious amounts of energy, Szilard helped perform some of the earliest experiments in the United States investigating fission, publishing key papers with Enrico Fermi and Walter Zinn in 1939. And while he famously disdained getting his hands dirty, he played a key role in helping Fermi set up the world's first nuclear reactor. As the scientists celebrated the historic moment with a bottle of Chianti, Szilard seems to have stood on the balcony and said, "This will go down as a dark chapter in the history of humanity". Once again he saw the Faustian bargain that the scientists were making with fate. It was during the war that Szilard's striking role as conscientious political advocate became clear. 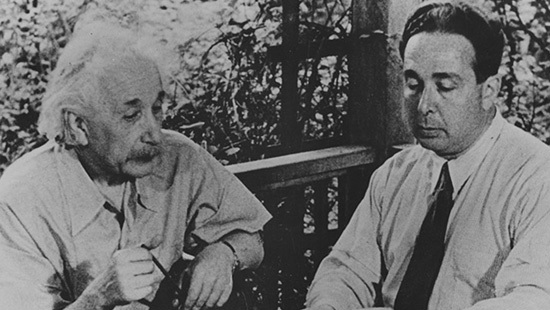 He famously alerted Einstein to the implications of fission - at this point in time (July 1939) Szilard and his fellow Hungarian expatriates were probably the only scientists who clearly saw the danger - and helped Einstein draft the now iconic letter to President Roosevelt. Einstein's name remains attached to the letter, Szilard's is often sidelined; a recent article about the letter from the Institute for Advanced study on my Facebook mentioned the former but not the latter. Without Szilard the bomb would have certainly been built, but the letter may never have been written and the beginnings of fission research in the US may have been delayed. When he was invited to join the Manhattan Project Szilard snubbed the invitation, declaring that anyone who went to Los Alamos would go crazy. He did remain connected to the project through the Met Lab in Chicago, however. In the process he drove Manhattan Project security up the wall through his rejection of compartmentalization; throughout his life Szilard had been - in the words of the biologist Jacques Monod - "as generous with his ideas as a Maori chief with his wives" and he favored open and honest scientific inquiry. At one point General Groves who was the head of the project even wrote a letter to Secretary of War Henry Stimson asking the secretary to consider incarcerating Szilard; Stimson who was a wise and humane man - he later took ancient and sacred Kyoto off Groves's atomic bomb target list - refused. Szilard's day in the sun came when he circulated a petition directed toward the president and signed by 70 scientists advocating a demonstration of the bomb to the Japanese and an attempt at cooperation in the field of atomic energy with the Soviets. This was activist Leo Szilard at his best. Groves was livid, Oppenheimer - who by now had tasted power and was an establishment man - was deeply hesitant and the petition was stashed away in a safe until after the war. Szilard's disappointment that his advice was not heeded turned to even bigger concern after the war when he witnessed the arms race between the two superpowers. In 1949 he wrote a remarkable fictitious story titled 'My Trial As A War Criminal' in which he imagined what would have happened had the United States lost the war to the Soviets; Szilard's point was that in participating in the creation of nuclear weapons, American scientists were no less or more complicit than their Russian counterparts. Szilard's take on the matter raised valuable questions about the moral responsibility of scientists, an issue that we are grappling with even today. The story played a small part in inspiring Soviet physicist Andrei Sakharov in his campaign for nuclear disarmament. Szilard also helped organize the Pugwash Conferences for disarmament, gave talks around the world on nuclear weapons, and met with Nikita Khrushchev in Manhattan in 1960; the result of this amiable meeting was both the gift of a Schick razor to Khrushchev and, more importantly, Khrushchev agreeing with Szilard's suggestion that a telephone hot-line be installed between Moscow and Washington for emergencies. The significance of this hot-line was acutely highlighted by the 1962 Cuban missile crisis. Sadly Szilard's later two attempts at meeting with Khrushchev failed. You may have already read it but if not, pick up a copy of Richard Rhodes, "The Making of the Atomic Bomb"... excellent read. And, of course Szilard is featured bigly.